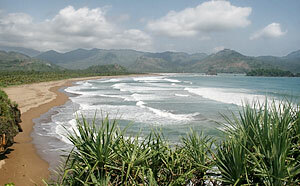 It is situated in Wonocoyo village, Panggul district, about 56 Km southwest of Trenggalek. This beach is still natural and well-known with its high waves. Not far from the beach (about 300 M) there is waterfall with 25 meters high. It is a place where people can take a bath intended to cure a certain disease and to make people stay young. Beside that, the visitors are also able to enjoy the beautiful coastal panorama from a small hill near the beach. A nature lovers could keep wondering when their visits the beautiful and virgin beach of Pelang. Saying that the place is a Kuta, a Niagara, and a Karangbolong in a package, could be exaggerating. At Pelang, you can spend your leisure time, lying on the white sand, listening to the poetry of the sea without being interrupted by curious beach bums, masseurs, or souvenir vendors, And to think of exploring the stunning cave! Situated at Panggung district, Pelang is a nice place to visit, especially for those who are not too obsessive about luxury. This is so quiet place that you can hear the voice of swallows between the rhythm of the waves that are similar to the ones of Kuta Beach. There is no restaurants and there is no hotel around Pelang. If you want to spend the night on the beach, you have to bring your own tents or sleeping bags and your own food. Along the hilly road to Pelang, you will enjoy the scenery of hills at a very unique configuration. One of the hills, from a distance, looks just like a giant pole towering among the others. You'd think that you'd never be able to get to close it. But, when you get to Dongko, the highest spot on the route, that hill is right beside you,like a pin that could have been installed by Mother Nature to keep the earth stable. The beauty of Pelang, unfortunately, has not been able to summon any investor. Although the nature of this place must be kept unchanged, it sure needs some "polishing". Once you lie on the beach, close your eyes and listen to the voice of nature.